Following the release at the 82nd Geneva Auto Salon in March, the Germans at TechArt invited us to experience their latest program at first hand. 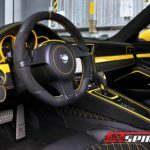 The brand new and first program linked to the seventh generation Porsche 911 made its official debut at the Swiss car show and we had a closer look at it near TechArt’s headquarter in Leonberg, Germany. The program is the first step in the release of numerous upgrades for the Porsche 991 model series and features mostly exterior and interior refinements. The newly developed TechArt exterior design for the Carrera and Carrera S models is immediately noticeable because of its yellow paint job. The 991 Carrera S also received a contrasting interior, which combines the exterior yellow color with the black interior. Underneath, all the changes, TechArt choose the Porsche 911 Carrera S with automatic PDK-transmission and Sport Chrono package as their basis for the press car. The 911 Carrera S with PDK manages to accelerate from naught to 100km/h in 4.3 seconds. Pressing the Sport Plus button on the optional Sport Chrono package cuts that to 4.1 seconds. The top speed is 304km/h. The Germans have not developed any technical parts of the car yet. The performance of the 3.8 liter flat-six engine still produces 400hp at 7,400rpm, and 325lb-ft of maximum torque at 5,600rpm. TechArt also skipped their carbon fiber engine design kit used on the previous 911 series. The engine is hardly visible when you open the engine hood at the back. So there was no need to develop any special parts or inner change any of the existing covers. The suspension setup of the TechArt 991 is similar to the stock 2012 911 Carrera S. The only major change to the ride comfort are the new wheels fitted. The TechArt Formula five-spoke light alloy wheel is available in 20- and 21-inch sizes. TechArt Formula III forged wheels with five dynamically designed double spokes are also available upon request by the customer. The forged wheels offer a weight advantage of up to 15 present compared to a cast wheels and the connected reduction in unsprung mass contributes to an increase in driving dynamics. In the end, the differences are of course noticeable, but the ride characteristics are marginal influenced by the larger 21 inch wheels fitted to our test car. The ride is slightly more bumpy, but not up to a level of uncomfortiness. On the outside, the main differences start of course with the wheels, which are combined with a newly designed front end consisting of a two-part TechArt front spoiler with an integrated splitter. In addition, two aero wings are integrated into the front air inlet vents. They provide the 991 with a more sportier look and a lower stance with respect to the tarmac. At the rear, the looks have been enhanced with a fixed rear spoiler with a trailing edge and an integrated third brake light. The stock wing cannot be used anymore with the new fixed wing in place. The new wing takes over all the aero dynamical features at the rear, even at high speed. The rear diffuser and side skirts on the wing of the vehicle complete the exterior range. Small touches are added in the form of subtle trim panels for the front headlights as well as side mirror panels. The overall looks of the car has noticeable been enhanced offering owners of a 2012 Porsche 911 Carrera and Carrera S the option to add a bold and more sporty look to their sports car from Zuffenhausen. TechArt is known for these kind of exterior design programs and this first aero kit is an excellent step heading into the future where they will release a large number of parts and packages based on the new 991-model series. 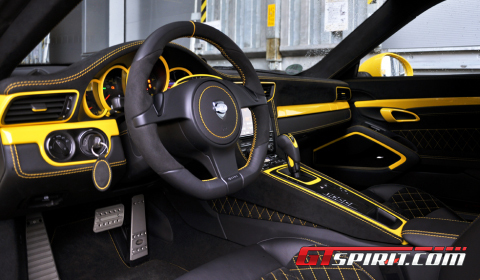 For the Panamera-style interior of the seventh generation benchmark sports car there is a range of the finest materials, stylish color combinations and numerous modification options, giving the customer the chance to implement all of the customizations they want. The press car had a combination between leather and alcantara color-matching the exterior looks of the car. The stitching is combined with matt-painted interior components in the doors, on the dashboard and on the center console. The door sills are yellow painted with TechArt logos confirming the car’s tuning origin. The sports steering wheel is the only TechArt part fitted inside the cabin and offers integrated paddle shifters for any type of setup. Customers can even opt for a multi-function steering wheel with paddle shifters. Surprisingly, this is an option Porsche doesn’t offer on their option list. So if you are interested in combining both, head over to TechArt and they will help you with your request. TechArt has achieved its goal in upgrading the exterior and interior design of Porsche’s latest offering in the 911 range. On the technical level, they did not change anything. 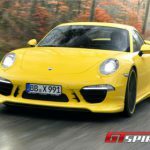 A performance upgrade will not be offered for the Carrera and Carrera S, and a suspension upgrade is still under development. In our opinion, these kind of technical refinements are requested for those people asking a more sporty package for their 991. On the subject of luxury perfection, the press car offered a higher level of refinement due to use of leather and alcantara inside the cabin. The exterior parts are just a matter of taste, but do suite the stock setup of the car. The wheels are a typical design statement by the Leonberg-based tuner, you either love or hate them. Overall, we haven’t changed our opinion after our first experience with the 2012 Porsche 911 Carrera S in December. The new Porsche 991 has become a sports car close to perfection, it is still not there, on the contrary it became more of a gran tourer capable of offering you sportiveness when requested. The pro and cons inside the stock Porsche 991 have not been touched by the specialists at TechArt. Underneath, you still have the same 911, only its appearance and presence have changed, providing you as customer the option to stand out.